Another one of our new projects~!? HOLY CRAP. Well, it’s hella easy, and kinda fluffy, and… Melly likes it? That doesn’t stop me from wanting to pimp-slap Matsuri to the ends of the universe, though. And if you don’t know what an Omamori is… You don’t know how to use links. HAH! HOW’S THAT TASTE!? Bah. Enjoy, shoujo fans. 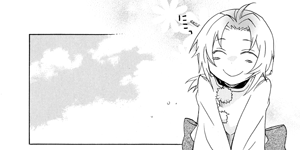 2 Comments on "Omamori no Kamisama vol1ch01"
Thank you for this chapter, it was really cute ;) Mimori is just adorable!